Even if you can't adopt one of our rescues, you can still make a difference by donating to the Arizona Border Collie Rescue. Making a donation is quick, convenient and safe! Best of all, since we are a registered 501(c)3 organization, it's tax deductible! Scroll down or Click Here to see ways to Donate Monetarily. Can't help financially? Click Here for Other ways you can Help AZBCR. Ruby was purchased originally from a puppy broker who arranged for the purchase from a breeder. Unfortunately, it was soon discovered that Ruby had bi-lateral hip dysplasia, the right being the worst. 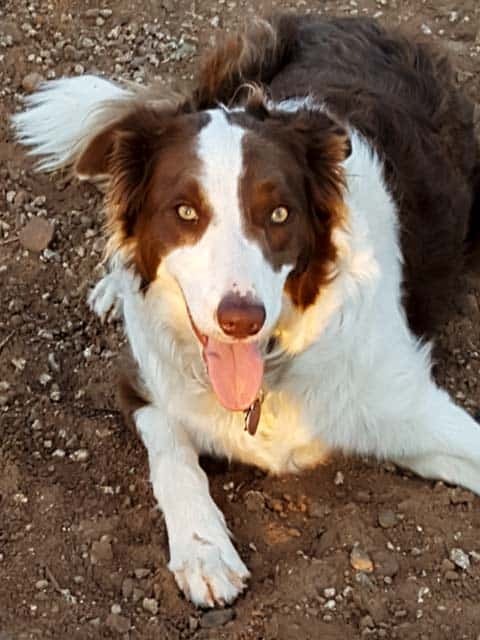 The breeder would not respond to the broker and even though the broker agreed to refund part of the fee to the owner, it was not enough for the required surgery so she relinquished the dog to Arizona Border Collie Rescue. Being under 1 year, we wanted to do the right thing for this young dog. AZBCR will be paying for her to have a full hip replacement which will give her full use of her leg enabling her to chase balls, go on hikes, whatever she wants to do. Ruby has been adopted by a wonderful family who was able to give her a place to be comfortable until she got old enough for the surgery. Now that she is a little older and her growth plates have closed, she is ready for her surgery. AZBCR has so many veterinary needs like this one and with our adoption rates so low, we must count on donations to help with these dogs. The surgery and rehab is about $9,000! Please help us with beautiful Ruby and all the other dogs. Your donations go directly to her veterinary needs. Click the "Help Ruby" button below and you’ll be able to choose what amount you want to donate and even choose to make this a regular monthly donation. Once you select the donation amount, you'll be redirected to our PayPal account to process your donation. as a Regular Monthly Donation.